With the monsoon rains playing truant in India, we are feeling a bit like fish out of water! 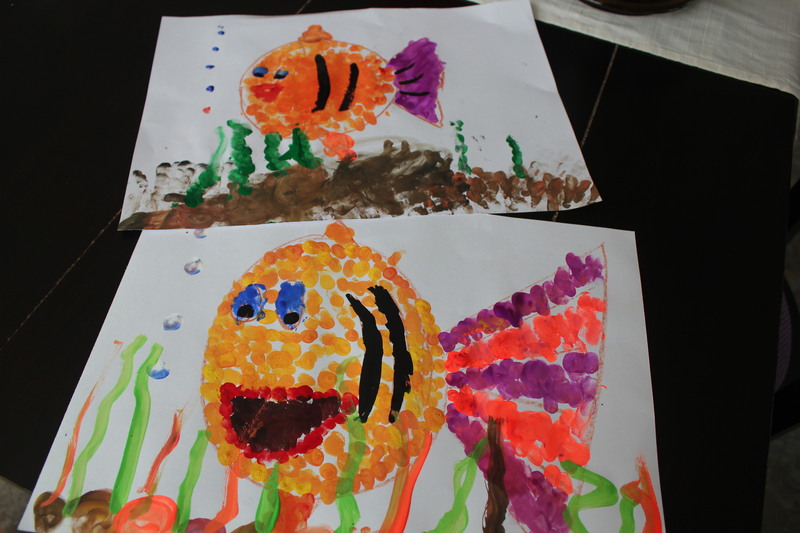 With fishes in mind and wishes for big drops of rain, we had some children put their fingers to good use. The ‘what you need list’ is rather simple here. A paper, pots of poster paint and lots of little finger tips. Newspapers to lay out, tissues and aprons would be good too! SImply draw out your fish or other aquatic creature. Then dip your fingers into the paint to dot on, swirl around and mush up. And parents, do have a go too! This entry was posted in Yucky Art and tagged Art, Book, Children, childrens books, Craft, handprints, icky yucky mucky, Kids books, poster paint by ickyyuckymucky. Bookmark the permalink.